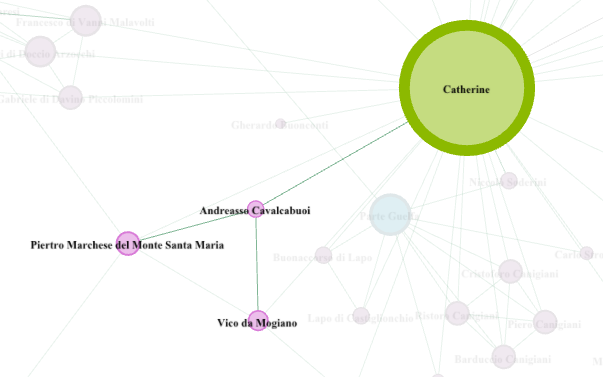 A Sienese Senator that Catherine befriended in the early 1370s, before she met Raymond of Capua. One letter is addressed to him, and it was from 1379 while he held the Senate position, which means Catherine maintained this connection and used it even at the end of her life. In this letter she told him, “I’ve really tried to arrange for you not to have this hardship, but our supreme pontiff, Pope Urban VI, has said (when I laid your case before him) that it seems good to him and he wants you, please, to come if you can and if it wouldn’t take long...”1 Here Catherine spoke for a government leader to the Pope using her status as a reputable living saint.